Gas exchange is the process by which oxygen and carbon dioxide (the respiratory gases) move in opposite directions across an organism's respiratory membranes, between the air or water of the external environment and the body fluids of the internal environment. Oxygen is needed by cells to extract energy from organic molecules, such as sugars, fatty acids, and amino acids. Carbon dioxide is produced in the process and must be disposed. The random movement of molecules is called diffusion. Although individual molecules move randomly, a substance can have directed movement, or net diffusion. The net diffusion of a substance occurs because of a difference in its concentration, or gradient , along its course. Within an animal's body as oxygen is used up and carbon dioxide produced, the concentration gradient of the two gases provides the direction for their diffusion. For example, as air or water nears the respiratory membrane, the oxygen concentration on the outside of the membrane is higher than on the internal side so oxygen diffuses inward. The concentration gradient for carbon dioxide is in the opposite direction, and so net diffusion of carbon dioxide keeps it diffusing out of the body. The solubility of the respiratory gases in water is low, and the solubility of oxygen is only about one-twentieth that of carbon dioxide. Special transport molecules within body fluids increase the oxygen content by holding oxygen molecules within circulating fluids. These molecules are called respiratory pigments and include hemoglobin , which is red, and hemocyanin, which is blue. These molecules combine with oxygen at the respiratory membrane, where oxygen concentrations are relatively high and easily release the oxygen in deeper tissues, which are low in oxygen. Filaments of a salmon's gills. 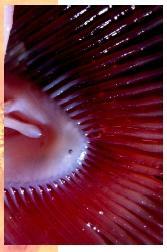 In fish, water is pumped across gills to enable gas exchange. Gills are respiratory organs that absorb oxygen from water as it flows over the gill surface. 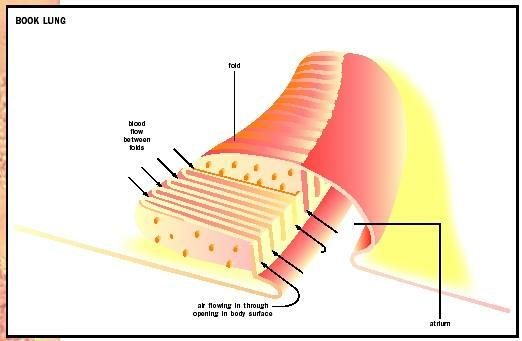 Book lungs are specialized, leaf-shaped, inward folds of the cuticle, surrounded by an air chamber that can be ventilated with muscular contractions. the legs sweeps water across the gill surfaces. In fish and some mollusks, gills are ventilated by muscular contractions that pump water across the respiratory surface. Terrestrial animals must protect their respiratory membranes from drying out. Many spiders have book lungs, which are specialized, leaf-shaped, inward folds of the cuticle, surrounded by an air chamber that can be ventilated with muscular contractions. In larger terrestrial insects, the respiratory organs are inward, branching, tubular extensions of the body wall called tracheae. 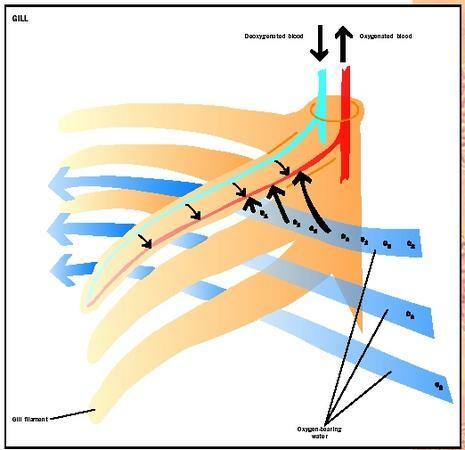 The system is so extensive that most cells are in close proximity to a tracheal branch and the tissues do not depend on blood circulation for gas transport. Terrestrial vertebrates generally have lungs. The surface area for gas exchange is correlated with metabolic rate. Endotherms, such as birds and mammals, have a high metabolic rate and a correspondingly high respiratory surface area. Birds have one-way flow through their lungs, enabled by a complex system of air-storing sacs. Since fresh air is always flowing through the lung, the oxygen concentration can be maintained at a constant, high level. Mammals, reptiles, and amphibians have saclike lungs with tidal (twoway) air flow. This results in residual air remaining in the lungs, reducing the concentration of available oxygen in comparison to bird lungs. Reptile lungs have fewer air sacs and less respiratory surface area than mammals, and amphibian lungs have less surface area than reptilian lungs. Guyton, Arthur C., and John E. Hall. Textbook of Medical Physiology. Philadelphia, PA: W. B Saunders, Co., 2000. Hickman, Cleveland P. Biology of the Invertebrates. St. Louis, MO: C. V. Mosby Co., 1973. Schmidt-Nielsen, Knut. Animal Physiology Adaptation and Environment. New York: Cambridge University Press, 1997.